So it's a little known fact about me that I am a complete sucker for online shooters. Not your Quakes or your Counter-Strikes, mind you - they're for children and grown adults who still have the superior reaction times of children. No, I like my shooters the way I like everything in life - just a little bit different. Payday was one of those shooters. Zombies run on curved lines, making them more organic-seeming and less predictable. Cops run in straight lines. Zombies take tactical advantage of their strengths and weakness (ie they run at you as soon as they see you). Cops take almost no tactical advantage of their strengths and weaknesses (ie they run at you as soon as they see you). Zombies die when you shoot them in the face. Cops die when you shoot them in the face three or four times. I loved the first game despite its laughable AI. I guess I did so primarily because it was a riff on the L4D formula, which itself is still fresh enough to support similar products with different body paint. Payday delivered the same style of frantic co-op drama that Turtle Rock's zombie game did, but I think profited from more varied objectives contextualised by a heist movie setting that's more interesting and liberating than L4D's get-to-the-chopper overtones. It's fun to shoot zombies with your mates; but it's more fun (at least in principle) to stride into a bank and tell everyone to get down while your mates disable the cameras and beat the vault codes out of the manager. Payday 1, then, was an average co-op shooter with horrible AI, but it was attached to a compelling and ambitious setting. The first thing to say about the sequel is that it does everything except fix the one bit that needed to be. 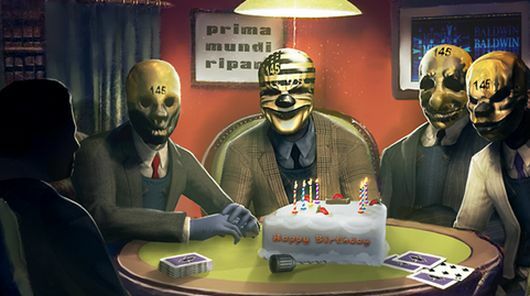 For all of Payday's reactive, multi-stage missions, for all of its weapon customisation, enhanced stealthing and more varied heists... no matter how much you enjoy these things (and I have done) the core of the game will be waiting just around the corner to slap you over the head and remind you that you're not an awesome super-crook; you're just a guy (can you use 'guy' as a unisex term in this way? Discuss. ), in a game, pretending to be a super-crook by shooting dozens of zombie cops in the face (many times each). The second thing to say is that a bunch of other stuff has changed. There is now a more extensive, XP-based weapon and character customisation system. Enough said about that. There is also a broader range of stealth options in the levels themselves, which is appreciated. It's still bloody hard to pull off a stealth run (and when one goes wrong it's doubly depressing that the relative complexity of the stealth systems isn't reflected in the relentless combat that your bumbling has triggered); but it's eminently more possible than it was in the first game, and more interesting to do, too. The scale of the levels has been altered too. It's worth noting that this is only the beta, and it comes with what I assume is a fraction of the full complement of maps (it's less than ten at the mo), but what is available is on a much smaller scale than the last batch. Gone are the days of being spread out over a vast complex of rooms and corridors; now we have much more intimate spaces. It feels less dynamic, but more plausible. It's hard to believe anything that happens in these games, but I guess four men are more likely to hold up a two storey jewelry shop on the high-street than a banking conglomerate. Sadly one repercussion of pinning the players into small spaces seems to have been the complete paralysis of the mission design team. Tasked with finding reasons to keep the criminal gang in a specified location for a particular length of time, the only thing they've been able to come up with is to drill holes in things, which takes loads of time, apparently, and is subject to frequent mechanical hitches. When you're not waiting for a drill to finish you're waiting for a van (or a boat, or a helicopter) to show up and whisk away the money. I know this happened a lot in the first game, too; but it seems worse here. No level has more than two real objectives: get the money, get out. I realise that's what a heist is, but what happened to interrogating bank managers, blowing through roofs and freeing captive prisoners? Again, I should note that there's loads of the game I've not seen yet; but what I have seen doesn't fill me with confidence. Presumably the downsizing was in order to make way for the series' new USP: the multi-stage missions where events in later maps are determined by performance in the earlier ones. Sadly there's only one mission available with three stages at the mo, so I can't comment on how well that's working. I'm aware that this is sounding a bit overwhelmingly negative. I don't mean it to - I've had fun with Payday 2, and I'm dying to see the new maps. I love the efforts Overkill have gone to to make this a world, not just a series of missions. I like being able to see my money and guns on a table in my safehouse, and getting a little audio briefing before a job. The guns are meatier too. It's just that I wish all these cool things were built around a better, more plausible game. Payday has always been close to delivering a truly special experience; the holistic career criminal experience. All it would take is half the cops with twice the brains. I appreciate that one little sentence entails years of work, but I think Payday is worth it. I like interacting with other people in more interesting ways than shooting them multiple times in the face, and Payday is still one of the best opportunities to do that. I probably shouldn't score this since it's only a beta, but I think you're smart enough to appreciate that and judge accordingly. Payday 2 is available on Steam for £24.99, or £29.99 for instant beta access. "I like interacting with other people in more interesting ways than shooting them multiple times in the face." A coda to modern gaming, really. Agreed wholeheartedly.